APNSS publishes a regular newsletter, Plate Numbers, featuring articles, an auction, classified ads and other information of interest to plate number single collectors. Occasional features include updates on new plate numbers and positions. Recent back issues are available from the Secretary for a nominal fee. Most historical back issues are available from the Librarian. 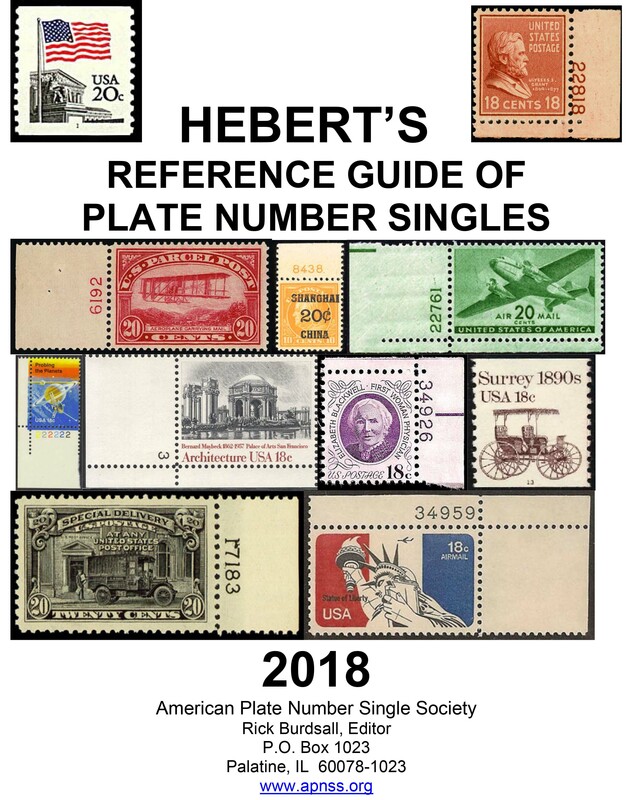 The Hebert's Standard Plate Number Single Catalogue is the authoritative work on the topic. Hebert's was first published by APNSS founding member Antonio Hebert in 1952 and is now in its 23rd edition. This reference work lists and prices individual plate numbers, positions, and other marginal markings for US stamps, beginning with the 1890 Small Banknote and 1893 Columbian issues. All prices are in U.S. dollars and include standard shipping to U.S. destinations via USPS Media Mail. Shipping to non-U.S. destinations or via Priority Mail is available for an additional fee. If you're interested in the 2018 Hebert's Catalog, there is always one available on eBay and BidStart (formerly StampWants). Both accept PayPal. You can also order directly from the Hebert's Editor by mailing a check payable to APNSS mailed to APNSS / Rick Burdsall, P.O. Box 1023, Palatine, IL 60078-1023. The 2011 edition was printed in August 2010. A few copies are still available from the editor. The 2007 Hebert's was listed in the regular "Books Received" review column in an October 2006 issue of Linn's Stamp News. Copies of the 2007 edition may still be available from Subway Stamps, item HR-013. Used copies of older Hebert's editions can sometimes be found on eBay. Reprints of Jim Ragsdale's article "How to Determine Partial Plate Numbers" are available on request for a nominal fee. Unfortunately this article is out of print, and no copies are available. Until an additional printing can be made, we recommend that you reference a reprinted article on the same topic that appears in the July 2006 United States Specialist. On May 27, 2006, the first day of the Washington 2006 stamp exposition, the United States Stamp Society (USSS) released the Encyclopedia of United States Stamps and Stamp Collecting. Individual chapters were serialized in the USSS's monthly journal The United States Specialist. The initial press run was sold out, so a second edition was printed. Check out the USSS web site for more information on the Encyclopedia. 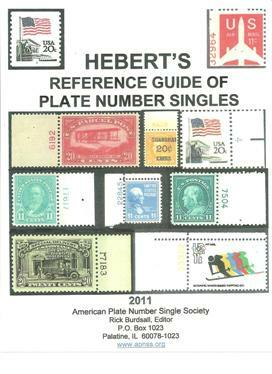 Wallace Cleland's article on the different plates of the 46¢ Ruth Benedict Great Americans stamp appears in the May 2012 United States Specialist, with a followup article in the July 2012 Specialist. Wallace Cleland's article on new plate numbers discovered on U.S. beer stamps appears in the April 2012 United States Specialist. 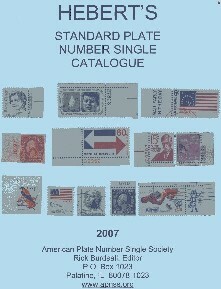 Wallace Cleland co-wrote an article on plate numbers of U.S. Customs Fee stamps that appears in the September 2011 United States Specialist. Wallace Cleland's article "U.S. Beer Stamps - A Primer" appears in the October 2008 United States Specialist. The article extensively describes the plate numbers used on these stamps and has copious illustrations. Wallace Cleland reports and illustrates a plate strip of the rare Class A Cigarette revenue stamp in the October Specialist. Wallace Cleland also describes and illustrates the plate number for the new printing of the 5¢ Toleware stamp, Scott 3756A, in the Specialist. Rick Burdsall's online article "How Big is a Plate Block?," written in response to a question from a Virtual Stamp Club member, now appears on the VSC home page. APNSS member Wallace Cleland has received the Walter W. Hopkinson Memorial Award for the best article or series of articles published in 2006. His series on AMG plate numbers (the Allied Military Government in post-WW II Germany, Italy, France and Austria) appeared in the US Specialist from April to October 2006. Additional details on the USSS web site. Doug D'Avino co-wrote an article on plate surface treatments such as the 'C' and 'CI' markings, part of an ongoing series on marginal markings. It appears in the July 2007 United States Specialist. Doug D'Avino co-wrote an article on producers' identification markings that appears in the February 2007 Specialist. Wallace Cleland's illustration of a possibly unique plate number discovered on the 1982 Christmas stamp, Madonna by Tiepolo (Scott 2026) appears in the February 2007 Specialist. APNSS members should check their holdings for plate number 12111. Thus far only one example has been reported, with two plate numbers appearing in a single plate strip of 20 under what would be positions 43 and 50 of the sheet. Doug D'Avino's profile of Clinton M. Hisle, one of the few men whose initials appear on early 20th Century flat plate stamps as both plate finisher (lower right initials) and siderographer (lower left initials), appears in the February 2007 Specialist. Wallace Cleland's article "The Start of the BEP Miscellaneous Engraved Plate Number Series" appears in the January 2007 Specialist. Wallace Cleland's article "Removal of Vignette Plate Numbers from 1878 Beer Stamps" shows examples of bi-color beer stamps with the vignette plate numbers in the center, and their counterparts with the vignette plate numbers in the margins. It appears in the November 2006 Specialist. Doug D'Avino writes about the International Association of Siderographers in "The Smallest Union," appearing in the November 2006 Specialist. Siderographers' initials appear on many flat plate issues of the early 20th Century. The seventh installment of Wallace Cleland's series on Allied Military Government plate blocks appears in the October 2006 Specialist. Some collectors feel these stamps, which were printed by the Bureau of Engraving and Printing for use in occupied military territories after World War II, should be listed in major catalogs along with the overprinted issues for Guam, Puerto Rico, Cuba and the Philippines following the Spanish-American War. The next Durland catalog plans to list and price these issues as plate blocks. The sixth installment of Wallace Cleland's series on Allied Military Government plate blocks appears in the September 2006 Specialist. Wallace Cleland provides a fifth installment in the continuing series on Allied Military Government plate blocks in the August 2006 Specialist. Doug D'Avino's article entitled "Archives of The International Association of Siderographers" appears in the August 2006 Specialist. He describes a visit to the union's archives, now stored at the University of Maryland. Wallace Cleland describes and illustrates some unusual hand-entered, corrected, inverted and misplaced plate numbers on 1914 Documentary stamps. His article "Plate Numbers on 1914 Documentary Stamps" appears in the May 2006 Specialist. Doug D'Avino co-authors an article describing and illustrating various forms of decorative banners in a continuing series on marginal markings, in the May 2006 Specialist. Wallace Cleland illustrates plate blocks of the Allied Military Government in France in the May 2006 Specialist. Collectors of U.S. revenue stamps will note similarities in the plate number position and distinctive font. Wallace Cleland's article "Unusual Plate Number Arrangement" appears in the April 2006 Specialist. This describes an outside-in numbering on some positions of the National Postal Museum issue. Wallace Cleland describes the extra "8" appearing in a plate number of the 1923 Harding Memorial issue. An example of the plate number is provided by APNSS member Larry Cohen, who also provided the copy which appears on our web site. The article appears in the April 2006 Specialist. Wallace Cleland describes an upside-down plate number on a U.S. revenue stamp in the December 2005 Specialist. Doug D'Avino co-authors an article on event titles that appear as marginal markings on U.S. stamps, in the December Specialist. Doug D'Avino describes and illustrates a PNS of a 1934 bottled spirits stamp with an unusual "CI" marking near the plate number, in the November Specialist. Wallace Cleland illustrates a fake PNS of a Canal Zone postage due stamp, Scott J19 (overprinted on U.S. Scott J62), along with the detective work that went into proving the fake. Both the fake and a real Canal Zone J19 are illustrated on the front cover of the November Specialist. A 1950 Specialist article about identifying partial plate numbers on booklets and coil stamps is reprinted in the November 2005 Specialist. Wallace Cleland introduces the topic and offers some comments and corrections to the original article. An article co-authored by Doug D'Avino, "A Categorization of Marginal Markings: A Historical Perspective by Presses - Part II - The Modern Era" appears in the August 2005 Specialist. Wallace Cleland's article "Ghost Plate Numbers" appears in the June 2005 Specialist. An article by Doug D'Avino on siderographer Andrew Black appears in the June 2005 Specialist. The article "A Categorization of Marginal Markings: A Historical Perspective By Presses - Part I - The Classic and BEP Eras," by Harold B. Collins and Doug D'Avino, appears in the May 2005 Specialist. Wallace Cleland's article "Imperforate Top Margins on 2¢ Washington Printed in 1919" appears in the May 2005 Specialist. Rick Burdsall's article "Plate Numbers" appears in the April 2005 Specialist. Doug D'Avino co-wrote an article "Samuel and Clyde De Binder," appearing in the April 2005 Specialist. This article traces the careers of two important BEP employees during the period when the siderographers' and plate finishers' initials were printed in the lower corners of flat plate sheets. Wallace Cleland's article "Rare Plate Number Found on 7¢ McKinley" appears in the February 2005 Specialist. Doug D'Avino describes some of the offerings in "Auction of the John Meek Collection of Marginal Markings and Plate Varieties - Part II," appearing in the February 2005 Specialist. APNSS members Wallace Cleland and Doug D'Avino team up for an article entitled "Pan Am Plate Sequence Numbers" in the January 2005 Specialist. Wallace Cleland's article "Postal People Back Plate Numbers" appears in the December 2004 Specialist. "A Categorization of Marginal Markings," co-authored by APNSS member Doug D'Avino, appears in the December 2004 Specialist. Two articles by Wallace Cleland, "Canal Zone 15¢ Star Plate Blocks" and "Plate Numbers on Tobacco Strip Stamps," appear in the November 2004 Specialist. APNSS members share their plate number material with other collectors through stamps shows and exhibits. APNSS members are entitled to a free classified ad in Plate Numbers. Longer or larger ads and commercial classified advertising can be arranged at reasonable rates. All advertising is handled by Plate Numbers Editor Rick Burdsall. For contact info, email the Secretary at the email address below. This page last updated September 3, 2017. Web site content Copyright ©2003-2017 American Plate Number Single Society. All rights reserved.